Annually this show is a delight. There is always originality and discovery. I apologise to all students that I did not get to see the whole show – one needs a day of high stamina to get around all of the galleries. I had neither a full day nor stamina. But here are some of my highlights. With regard to originality the garment on the right by Martina Stefkova Simeonova ticks many of the boxes. It is not a piece of art as I ha d first thought. It is very much a wearable garment. It is made of Lycra – so, probably not that easy to put together especially with bright orange stitching. The influence, according to Simeonova is vintage tennis gear. The skirt – which is probably not that practical on a tennis court – is pleated and held rigid by kebab sticks. Sensational. Then there is the furniture. 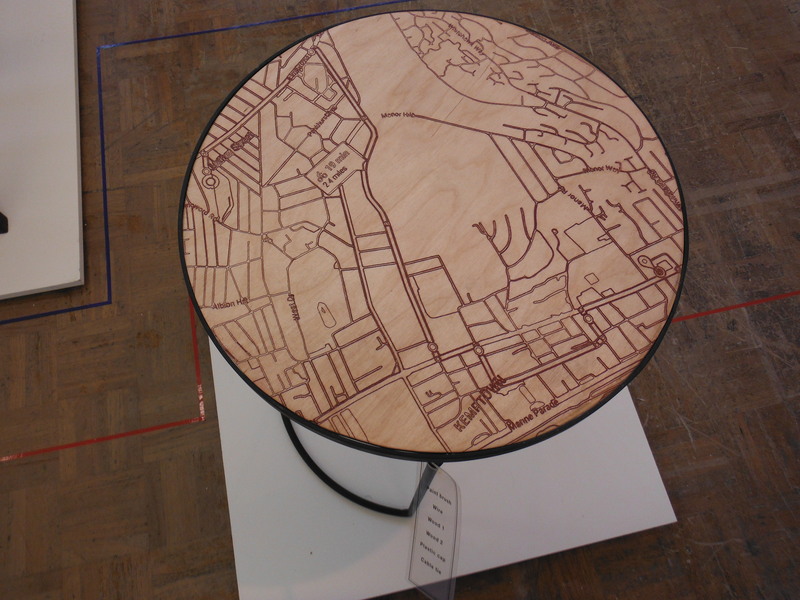 The example on the left is the work of Liam O’Hagen Paul and is essentially cycle routes around Brighton. He argues that the journey is better than arrival. This may be youthful exuberance – as a keen youthful cyclist myself many years back I am sure I once felt the same – but if this is the collateral, then keep it up. I’d love this in my house. 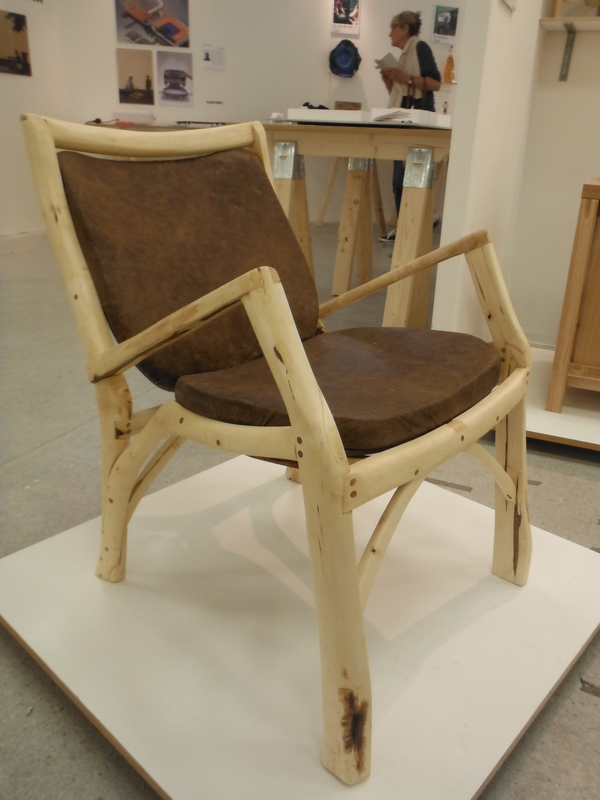 And then this stunning chair. Probably not the most comfortable but beautifully made capitalising on the natural bends and imperfections of the wood. But more interestingly, perhaps, is the influence of the roof timbers of an old tithe barn. Another piece by the same furniture maker (left) illustrates this better. 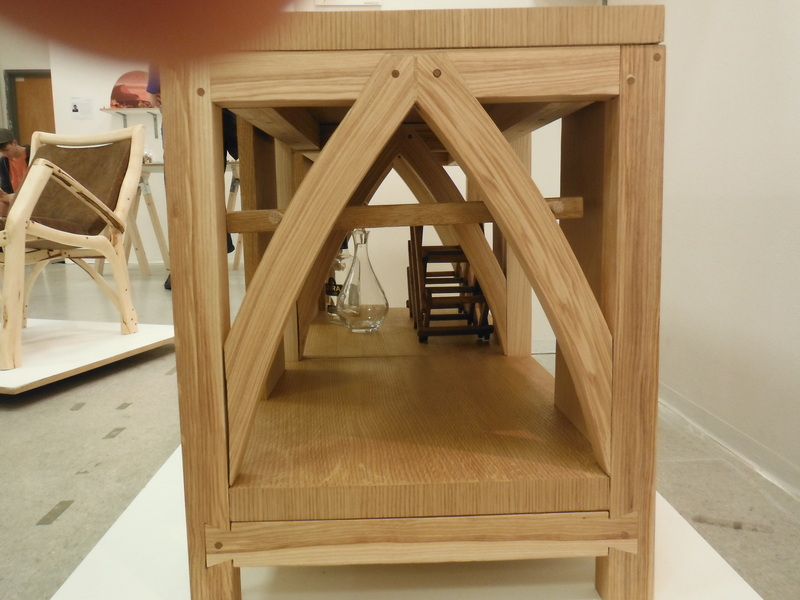 It is a cabinet, I think made of oak, and wonderfully arched like the tithe barn roof. Ever wondered what a migraine looks like? I have to say that I haven’t only because I have never suffered from such pervasive pain. 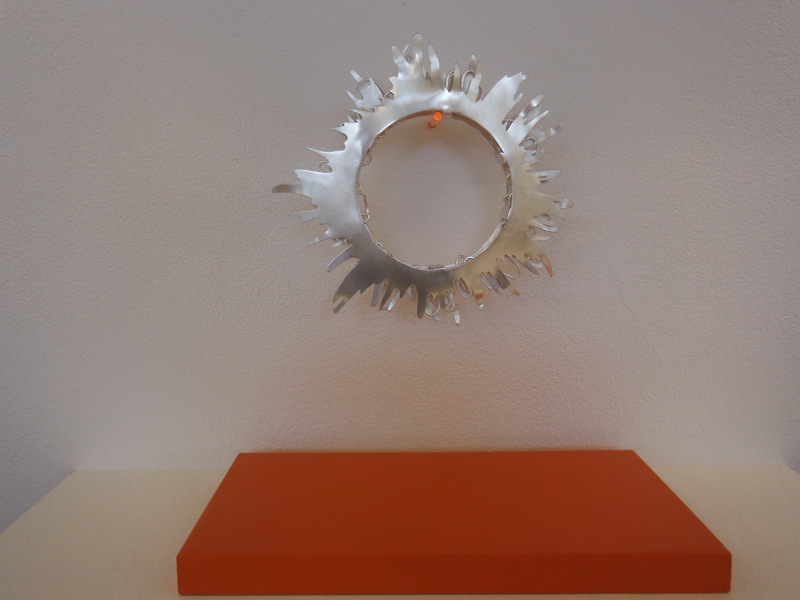 Jemima Bellamy has investigated the condition and has produced some visually representative jewellery that, as she argues, “challenges the visual and physical parameters to both alleviate and aggravate the migraine”. I am not sure exactly how it works, but the pieces are special (see right, for example). Staying with the theme of health and illness, Ember Vincent represents her own experience of Chronic Fatigue Syndrome (ME). These bowls are a fusion of ceramics and metals. Ultimately they represent the tendency of sufferers of ME and other illnesses to hide their “broken selves” behind tough exteriors. The utility of the bowls is not high. But they are wonderful. There is al ways room for tea, I feel. Xufei Zhu undertook a study of Chinese and British cultural differences in relation to tea and life – in particular, contemporary living and its stresses. 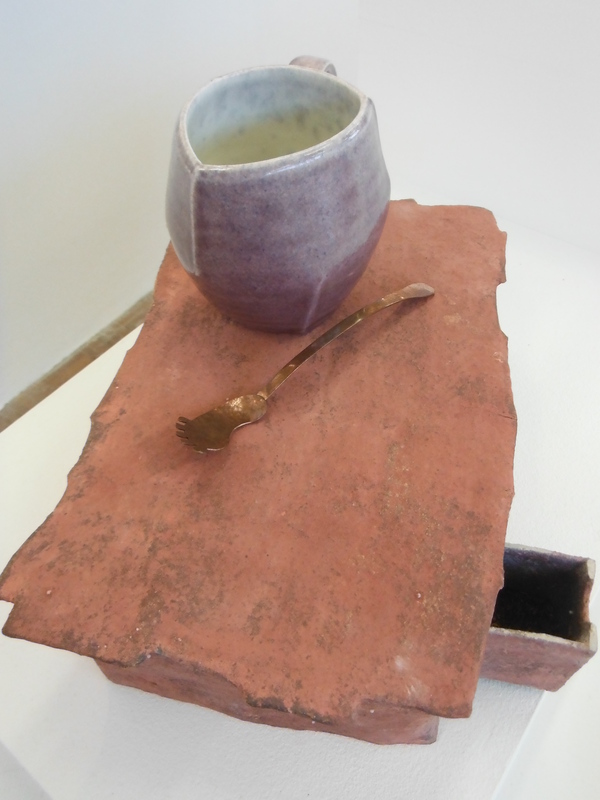 These are captured in her tea pots, cups and utensils. This foot shaped teaspoon is exquisite. The next artefact to bowl me over was Teenie Connolly’s kingfisher. Made of reclaimed materials collected on walks between Brighton and Newhaven, they – and the complementary pots – represent the weaving undertaken by birds to make nests. She says that she has enjoyed a close relationship with birds in nursing a number back to health. Her underlying theme, however, is sustainability. 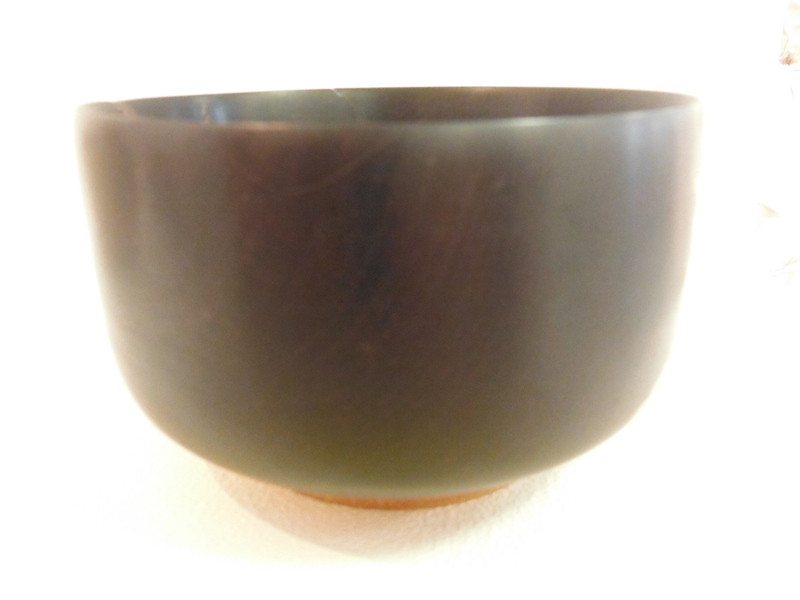 Next up is this extraordinary bowl made of desert ironwood and embellished with copper powder and epoxy resin. It has been precisely machined and sanded to 1200 gsm (I assume that is also precise). Because the wood is so dense it has a discrete functionality. 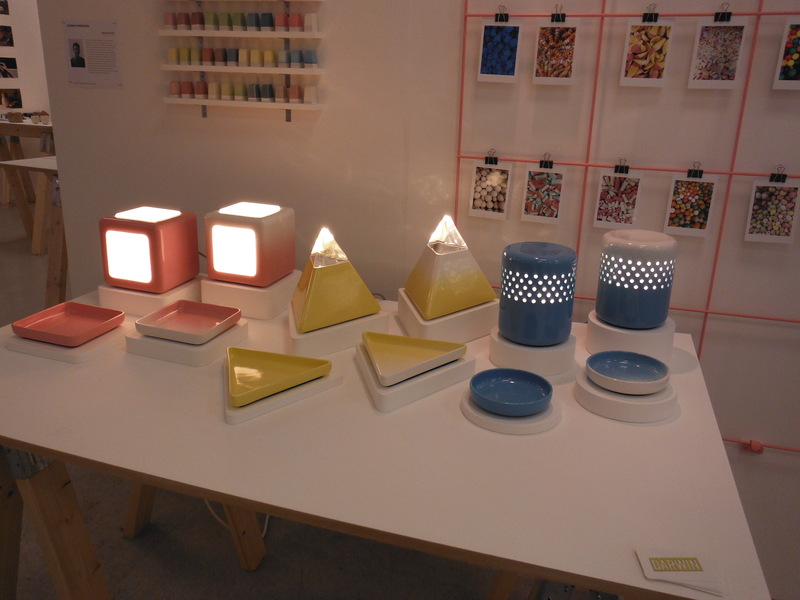 Finally in this section, I was beguiled by these lamps (left) by Darwin Simmonds. His theme encapsulates playfulness, childhood, fun and, ultimately, happiness. They are certainly uplifting in their bold colours and light emission. Who or what is Pond? Let me quote Wikipedia: “Featuring a revolving line-up, the band currently consists of Nick Allbrook, Jay Watson, Joe Ryan and Jamie Terry. 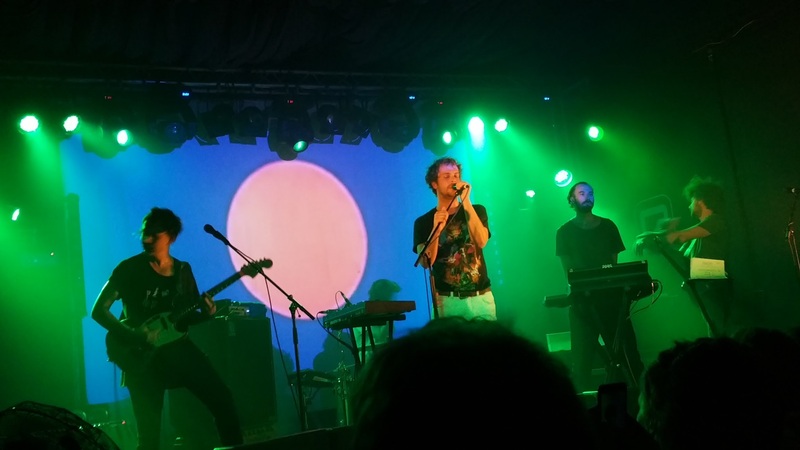 Pond often shares its members with fellow Australian psychedelic rock band Tame Impala. Jay Watson is a full member of both acts, while Pond band leader Nick Allbrook contributed to both bands from 2009 until 2013. 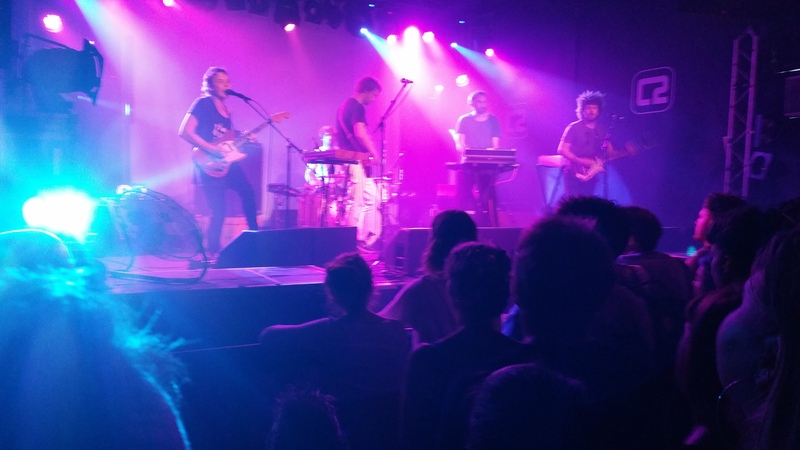 Current Tame Impala members Kevin Parker, Cam Avery and Julien Barbagallo are all former members of Pond, with Parker continuing to work with the band as its record producer.” The other member who I trust was on stage on Thursday was James Ireland on drums? According to Douglas Adams in the Hitch Hiker’s Guide to the Galaxy, the loudest band in the universe is Disaster Area, a plutonium rock band; probably not only the loudest band in the universe, but the loudest noise of any kind. Pond come second. Just. I reviewed their 6th album, Man It Feels Like Space Again, a couple of years ago. Everything I said there is valid for this gig. The songs are probably not that meaningful. The lyrics are hard to hear let alone understand – originally I had thought it was Nick Allbrook’s limited voice, but I was wrong on that. He belted out the lyrics, but the other four just went for it as well. The melodies are there, the song structures are a mixture of classic symmetrics and asymmetric mini operas. Key changes galore. Compelling. Allbrook is a performer like no other. He is a small package with a compensating stage presence. Be warned, he will throw himself into the audience with a confidence that only comes with extended youth (he’s a nightmare for venue security trying to temper audience exuberance). His guitar is one of the most beaten-up specimens that I have ever seen. I contrast his guitar husbandry with that of Richard Hawley who employs a guitar dresser to tune and pollish them before each performance. What else did they play? A few tracks from the new album including 3000 Megatons and Sweep me off My Feet. Both wrap themselves around you – they are a Phil Spector wall of sound without the commercial hang-ups. Whilst I’d love everyone to love Pond, please don’t like them enough to force them into bigger venues. When Allbrook sweats, I need to feel that, too. A re you 20 something and a bit warm? Do you live too far away from the beach or pool? 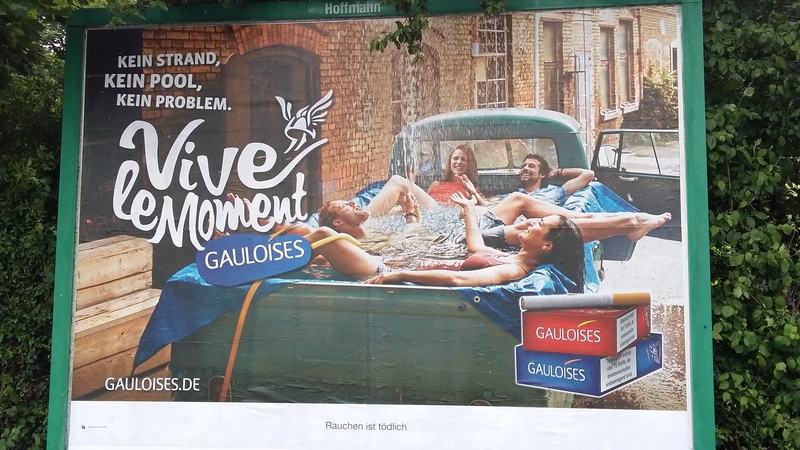 Why not compensate by filling up the back of a pick-up truck with water and then jump into it with your clothes on with three equally motivated souls? Vive le Moment. 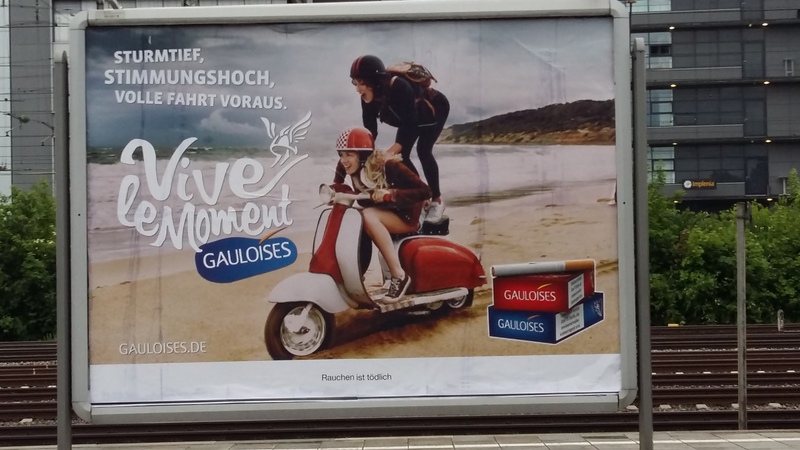 Next, are you in a really good mood and also have a cool scooter that you want to trash by attempting to ride it in a squ at position on the beach with your mate standing up behind you? Albeit with a crash helmet on. (Is that required in France?). Might you do this because there is are some storm clouds in the distance? Good. Vive Le Moment. 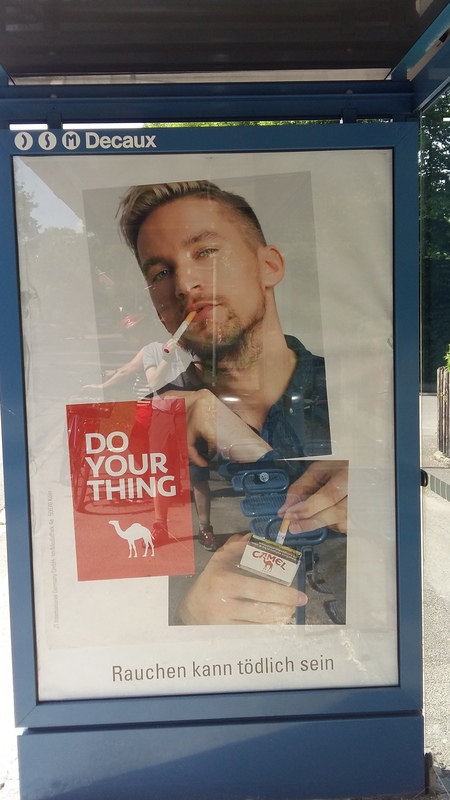 Cam el’s Do Your Thing campaign is back. Apologies about the picture, but a sunny day and poster is stuck behind plastic. Not great for photography. The approach is the same, however. Person with attitude looks to camera to say, “look at me, I don’t care about your or me, for that matter”. Curious approach to promoting the brand. What always seemed to me to express some kind of exoticism now seems to promote white nationalism!